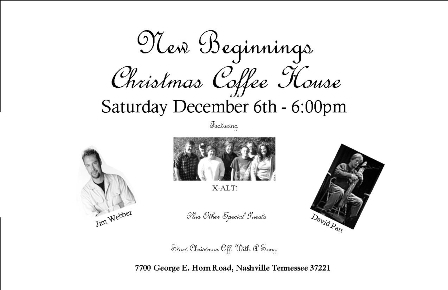 I’d like to invite all of you to what has become an annual tradition: the X-Alt Christmas Coffeehouse at New Beginnings Church in Bellevue. There will be lots of music to get you and your family in the Christmas spirit, along with the usual coffees and baked goodies, all upcoming this Saturday night. This will be the only time this year we will drag our Christmas set out of mothballs (and we have some unique arrangements), so this is your only chance to hear it. But, for those of you who need a little extra urging, Jim Weber, singer-songwriter extrodinaire, will be there. Every time we’ve had Jim at a coffeehouse, he’s brought the house down. There are others who will join in the celebration, but the one you just absolutely HAVE to see is a musician named David Parr. We know him from way back (I haven’t seen David in years). He plays the most unique instrument I’ve ever seen, the Chapman Stick . The best description I know for it is it’s a stringed instrument, but it’s played like a piano. All I know is that when in Parr’s very talented hands, it’s one of the most beautiful instruments I’ve ever heard. Finally, on a personal note, this would be a good chance to see Fat Slarti, before I go on another weight loss quest. Also, you can see Skinny Susie (ask her about her unorthodox weight loss plan – I’m a believer now! ), and greet the recently ordained Pastor (Reverend? Brother? Most Excellent?) Mark Mills. The fun starts Saturday night at 6:00 pm, at New Beginnings Church (7700 George E Horn Road, 37221). We’d love to see you there. I didn’t want to let too much time pass before I mentioned the incredible experience I had this weekend. X-Alt took part this past Saturday in an open house event for the community in Bordeaux at Word of Life Christian Center. The church had gone all out with marvelous food, inflatable slides for the kids, “fair” fare (snow cones, cotton candy), and music. Politicians were there (including the local legend Thelma Harper), and there was some speechifying. There was some not-so-subtle campaigning, and although many in our band probably won’t vote the same way as many present, one had to be struck by the sense of urgency and commitment felt by most present. Anyway, that was only a tiny part of the proceedings, and when the music started, it was hard not to be swept up by the spirit present in this very hot and sticky (and windy) outdoor venue. Our set was not bad (we REALLY miss Mark Mills! ), and by the end of the second set, we had hit our stride. The members of the Nashville “biker church” had showed up, and that coincided with us starting our rock set. The timing couldn’t have been better. You haven’t lived till you’ve won over a crowd of bikers with your version of “Jesus is Just Alright”. When the church’s praise team did their set, things really started rolling. I can’t tell you how much I enjoy this group. It’s just hard not to get excited when they are singing. I sometimes forget to thank God for the incredible gift I’ve been given. I have been given a small view of the width and breadth of the way Christians of all backgrounds worship Christ. I have been in high churches with great organs and soaring choirs, singing some of the greatest hymns ever written by some of the greatest composers in history. I’ve seen the quiet, somber worship of those struggling to overcome addictions. I’ve heard great scriptural teachings, and liturgies that have been spoken for centuries, and heartfelt prayers inspired on the spot. I’ve worshipped with prisoners who sing, and feel, every word of ‘Amazing Grace’. Jesus left us with a specific prayer, and He told us that we would one day worship in spirit and in truth, but He pretty much left the ‘how’ open. He did not tell us to face a certain direction, or say ‘x’ number of prayers per day, or do this or that meditation to reach enlightenment. He did not dictate rituals that must be performed by His followers. He did not tell us to make a pilgrimage to a geographic spot, or to sing certain songs, if we sing at all. Now, we Christians argue over these things; we have for centuries now. But, I really feel in my heart that God is pleased, not dismayed, by the almost unlimited ways His children display their love for him. This event was not billed as a worship service, but that’s what it was. Surely, this is the stuff of Heaven, no? I sure hope Ford got some good pictures for the X-alt blog. Y’all check later, it was really a great day. So, what’s been going on in my life? What HASN’T Been going on? I now present to you the random bits and pieces of thoughts that have been swirling around in my head lately. I was puffed up and extremely humbled within the space of one hour this past Sunday. X-Alt went back to prison, and before we did my new song, Ford Prefect said some kind words about my writing ability, for which I am most appreciative. Yet, I wasn’t even the best songwriter in the room that day. The men did a couple of songs for us, and there was one that had the hook: “I am more than flesh and bone”. Y’all. I can’t tell you how well this song was written. The phrasing, the storyline, the hook – if I can ever write like that, then I’d call myself a writer. I was taken aback by the men’s reaction when a speaker said “There are demons out there. There are demons in this place”. Their vehement agreement made me shudder to think what they go through on a daily basis. BTW, I’m here to tell you that the community is safe. If any vagabond do-gooders ever tried to break INTO prison, they would be stopped at every turn. Somebody forgot to leave a memo about our visit at the front desk, and we sat there for well over an hour as the coordinator and the prison staff tried to work things out. We knew the men were expecting us, and we didn’t want to let them down. As a result, we got started late and had to cut things short. As usual, I think we got more out of the service than the men did. Now I’ve given you an earworm I’m sure you don’t appreciate. What? I’m sorry, but being 43 years old, there’s now parts of me I can’t see on my own anymore. You don’t want me to get Lyme Disease, do you? And no, I’m not whining. I have an overwhelming desire to see the episode of Sanford and Son where BB King performed “How Blue Can You Get”. It was also the first time I ever heard the name “Lipshitz”. The memory of the way Bubba said it still makes me laugh to the day. Did anyone else love that show asmuch as I did? Bold prediction: The final three in DWTS will be Mario, Jason Taylor, and Kristi Yamaguchi. That being said, Shannon Elizabeth’s waltz was simply mesmerising. It was so beautiful it almost made you feel that dull, longing ache one feels when confronted with an indescribably overwhelming beauty. The fact that I not only watch but actully like DWTS causes me far more ribbing than my Ugly Betty thing. Something that affects me, both at work and beyond: I’m a “big picture” thinker. I understand, I thrive on understanding complex systems and their interdependencies. I can’t tell you how many times I can see clearly a whole end-to-end system, but I have the hardest time explaining what’s in my head to my single-task oriented coworkers. I also seem to have the same communication gap outside of work with policy wonks. We might as well be speaking Apache and Cantonese. Anyway, I hope you’ve enjoyed this roller coaster journey into my brain. I promise, soon I’ll give you something a little less disjointed. PS – I haven’t seen some of you in quite a while. I think it’s time we remedied that.